If you have done your homework, you have probably heard a lot about the Tortuguero National Park and the popular Tortuguero canal tours. Costa Rica ecotourism is second to none, so if you love nature and wildlife, one day in Tortuguero is just not enough. There is so much more to Tortuguero than just the canals! Our naturalist guides would love to share it all with you. We invite you to immerse yourself in nature on our Tortuguero Costa Rica 2 day Expedition. In fact, we want you to explore the Tortuguero canals so much, we make it possible from 3 different regions in Costa Rica; San Jose, Arenal, & Puerto Viejo! Formally a chain of volcanic islands, the aptly named Tortuguero National Park is a perfect location for green and leatherback turtles to nest and for baby turtles to make their first trek into the ocean. No roads to Tortuguero means it is only accessible by boat or small plane. The remote location keeps this section of Costa Rica rainforest virtually untouched. Well, untouched except for the wildlife that thrives here safely hidden in the rainforest canopy. The Tortuguero National Park has eleven different habitats. You can experience rainforests, mangrove forests, swamps, beaches and lagoons all in one day. So grab your cameras and get ready to spot sloths, howler monkeys, toucans, crocodiles, turtles, water birds, colorful frogs and butterflies...and in season, sea turtles!! 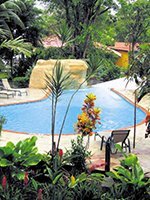 Morning: Drive from San José, Arenal or Puerto Viejo, breakfast at Exploration Center, hotel check-in. Afternoon: Tortuguero Village tour, leisure time. Evening: Seasonal turtle nesting tour or night hike tour (optional). Pour yourself a cup of Costa Rica's delicious coffee because this tour departs early. We will stop and take a break to stretch our legs and eat breakfast at the Exploration Center in Siquirres. After breakfast we will make the short drive to Caño Blanco where we will board the safari style pontoon boats that will take us to Tortuguero. Have your cameras ready because your adventure begins as we navigate our way through the waterways of the Tortuguero National Park. Once you have checked into your chosen hotel, we will meet up and explore Tortuguero Village. In the evening you can choose between the optional sea turtle nesting tour or a night hike. If you are lucky enough to schedule your vacation while the Green Turtles are nesting (July - October), you will not want to miss out on the sea turtle nesting tour. If the sea turtles are not around, the night hike is a really cool alternative to see a whole different side to Tortuguero's diverse wildlife. Morning: Canoe tour, breakfast, leisure time, and check-out. Afternoon: 12:00 pm boat ride and drive to Exploration center and on to San José, Arenal or Puerto Viejo. Day two we will get up early again to take advantage of the early light to spot the many birds and animals that converge on the canals at dawn. The best way to get close to nature is in complete silence, so we will explore the Tortuguero canals via canoe. Canoes are the perfect vessel to carry us deep into the jungle to explore the hidden lagoons and narrow paths of the Tortuguero canals. Needless to say there will be plenty of opportunity to capture Nat Geo worthy photos! Feel free to ask your knowledgeable naturalist guide any questions as you paddle through the Tortuguero canals seeking wildlife. This is a learning experience of a lifetime! After our Tortuguero canal tour, we will eat a delicious breakfast together then get ready to head on to your next destination departing at noon. Morning: Drive from San José, Arenal or Puerto Viejo, breakfast at Exploration Center. Afternoon: Hotel check-in, Tortuguero Village Tour, leisure time. Evening: Seasonal turtle nesting tour or night hike tour (optional). Additional $25 / from July to October only. Morning: Naturalist Canoe Tour at 5:30 am. Breakfast, and at 11 a.m. start the guided hike to Tortuguero national Park. Afternoon: On your own. We recommend you take the tour to Cerro Tortuguero ($40). Morning: Breakfast, leisure time, and check-out. Afternoon: Shuttle out leaves at 12 noon from Costa Rica Roots Tours Office, the boat ride and drive to Exploration center and on to San José, Arenal or Puerto Viejo. Whether you choose the economic or standard room, the overnight Tortuguero Tour is the best way to get the most out of your experience in Tortuguero, Costa Rica. And if you book with The Real Deal tours, you can be sure you are getting the best deal in Costa Rica! If rustic simplicity is your style and you are looking to save a buck, La Casona is the perfect option for you. 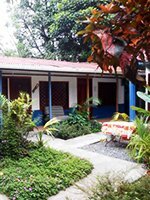 This rustic hostel is located right in the heart of Tortuguero Village. 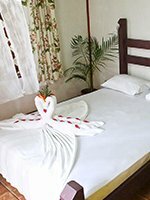 They are only 50 meters from the beach and 50 meters from the entrance of Tortuguero National Park. Most importantly, La Casona is walking distance to anything you could need in the village such as an ATM or mini mart for anything you may have forgotten. 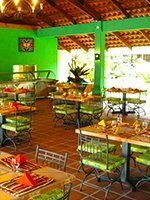 La Casona has been managed by the same Tico family who founded it over 16 years ago. Keeping in line with the Costa Rican way reduce, re-use and recycle, La Casona strives to lead the way in sustainability practices committed to the environment. During your stay they will do their best to educate their guests on ways to save water and energy and of course recycling and composting. With only 12 rooms, you can guarantee that you will receive personalized attention and service as well. 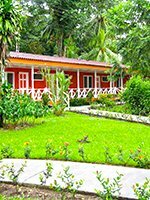 Even though it is in the center of the Tortuguero, La Casona is surrounded by lush tropical gardens that attract all sorts of butterflies and hummingbirds. La Casona is our recommendation for a chill play to stay in harmony with nature. Round-trip or continuing transportation from San Jose, Puerto Viejo, or Arenal Volcano regions. Departures: 5:30-6:30 am depending on pick-up location. Length: 2 or 3 days, returning around 5:30pm the second day. Children: Tortuguero is a wonderful family trip and there is no minimum age. Kids pricing same as adults. Keep in mind it is a long distance to travel in just 2 days. The journey is broken up with stops for breakfast and a boat ride, however can be a bit much for really young ones. Restrictions: Please note the pricing is based on double occupancy. If you are traveling solo, you can book the Economy option with a supplemental charge of $15. Insider Tip: This is really the best deal around for exploring Tortuguero. Not many other operations include transportation in their packets, and none other offer transportation from one destination to another. If you are a bit more adventurous, we suggest you add a day of Rafting Pacuare River onto your package. There is discounted rates available for combos! Know Before You Go: Before you go, please take a look at our Tortuguero FAQ’s. If you have not done your homework, brush up on your knowledge about Tortuguero National Park. Tortuguero Expedition 2 Days deposit is $25.00 per Adult with the Economic Package. Tortuguero Expedition 3 Days deposit is $35.00 per Adult with the Economic Package. This tour departs between 5:30 to 6:30 AM. 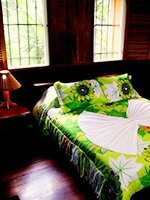 Have you always dreamed of waking up in the rainforest to birds chirping outside your windows and monkeys howling in the distance? If so, then La Baula Lodge is the place for you! 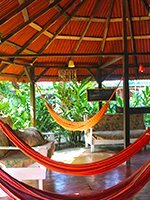 This beautiful lodge is located on 2 hectares (nearly 5 acres) of lush Costa Rica rainforest protected by the Tortuguero canals on either side. There are 40 spacious rooms painted in a variety of bright Caribbean style hues. Most importantly, every room at the La Baula Lodge offers rainforest views! Aside from lush rainforest, La Baula Lodge also features a swimming pool, nature walking trails and an open-air restaurant with an extensive bar. Basically they offer everything you need so you do not even think about having to take a water taxi into the village. Just you immersed in nature. Can you think of anything better? If you want to immerse yourself in nature but not leave behind too many comforts of home, then La Baula Lodge is the perfect choice for you. Tortuguero Expedition 2 Days deposit is $30.00 per Adult with the Standard Package. Tortuguero Expedition 3 Days deposit is $40.00 per Adult with the Standard Package.